Sky Zone Boston is Massachusetts' original trampoline park (the first trampoline park in New England, actually)! Often imitated, but never surpassed, we provide healthy, active FUN disguised as all ages entertainment. We’ve been voted the number one “out of the box” workout and the “best party ever.” Experience WOW – the weightlessness of bouncing, flipping and landing in a pit filled with 10,000 foam cubes. Sky Zone Boston is dedicated to providing you with the pure joy that comes with flying. We are sky lovers, thrill seekers and people who believe that jumping is freedom. We believe fitness can be fun and play can be smart. We are healthy and bursting with energy. We fly high and keep it safe. We are Sky Zone. 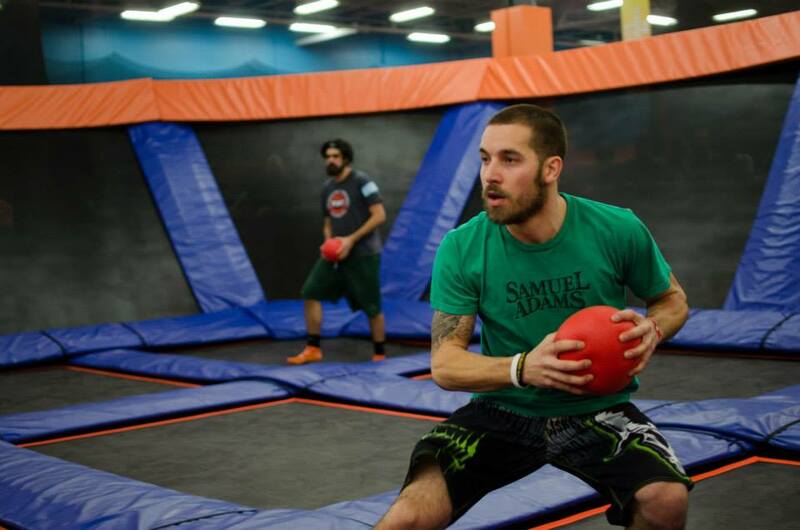 Located in the Boston neighborhood of Hyde Park, Sky Zone Boston was completed in 2010, and offers Open Jump, SkyFit classes, Ultimate Dodgeball (when available), Toddler Time, The Warrior Course, a Warped Wall and many other exciting activities and programs. For just about any age, shape or size, Sky Zone Boston is epic, active fun! Learn more about our hours and pricing, or book your tickets now. If you love to stay active and are usually smiling, come work with us! Check out our Careers Page for details. Want to know the latest promotions, programs and attractions at Sky Zone Boston? Sign up for email updates! Get a 10-punch pass for Toddler Time for $89! That's a savings of $31! Sky Zone has specially designed awesome SkySocks to enhance your jumping experience. You can bring your own pre-used SkySocks or purchase a new pair for only $2.99. SkySocks are required for all jumpers. CAN I JUMP WITH MY CHILD? Sky Zone offers tons of awesome activities for every kind of thrill seeker. Fly high with friends, dunk on the SkyHoops, jump into the Foam Zone, conquer our Warped Wall, or compete on our Warrior Course. Outside food is not allowed, but we have tons of healthy & tasty options at our Fuel Zone! WHAT IS THE DIFFERENCE BETWEEN A RESERVATION AND A BIRTHDAY PARTY? A reservation is for jumping only. Birthday parties include jump time, a party room, pizza and more! Check out our full selection of Party Packages at skyzone.com/boston/parties-and-events/parties. Waivers are kept on file for one year. However, it’s always a good idea to call ahead to see if your waiver remains valid. You must have the specific waiver completed for the actual Sky Zone park you are visiting (a Sky Zone waiver at one park is not valid at a different park). But don’t worry, you can complete your waiver online https://bostonstore.skyzone.com/waiver/ before getting to Sky Zone Boston! I HAVE TO WEAR A HARD CAST. CAN I STILL JUMP? Unfortunately, hard casts of any kind are not allowed on Sky Zone courts. Sky Bands are an awesome, easy way to show off your tricks on the trampoline court. When you buy a wristband, your jump time is recorded on our SkyCam, then viewable/downloadable at skyzone.com/skycam! SkyBands are $2 and are available online or at the park (and make a great addition to any gift card or party favor pack). Our Toddler Court is designated for jumpers ages 4 and under. It's open every day, from the time we open until 8pm. Toddler Time is a special morning event for toddlers 5 & under that happens Mondays & Wednesdays from 9:30 AM - 11:00 AM and on weekends from 8:30 AM - 10:00 AM. Toddler Time jumpers can can enjoy bouncing, play time, and special activities on our main trampoline court under the supervision of their parents, and without interference from the big kids. Toddler Time is walk-in only and costs $16 per family.